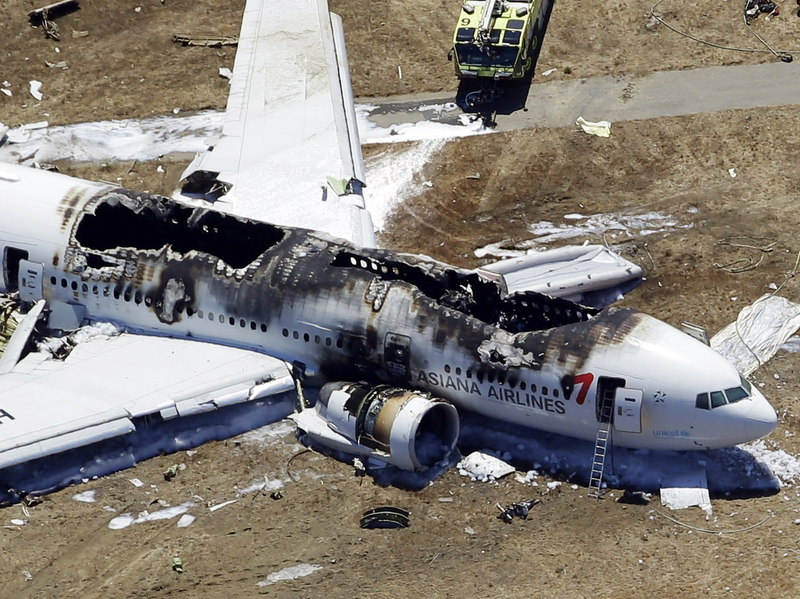 Videos Show Asiana Crash Victim Was Run Over Despite Warnings : The Two-Way Emergency personnel had known a Chinese teenager was lying on the ground at San Francisco International Airport near the wreckage. But as they spread foam on the area, she was covered up. Tragically, two fire trucks later ran over the girl. A coroner says those blows caused her death. Newly revealed videos show that some emergency personnel did know there was a victim lying on the ground near the burning wreckage of an Asiana Airlines passenger jet last July in San Francisco and that they warned other first responders at the scene. But fire trucks later ran over the teenage victim at least twice. The local coroner has previously ruled that 16-year-old Ye Meng Yuan of China survived the crash of the flight from Seoul, only to die from "crushing injuries consistent with [being struck by] a motor vehicle." When first responders got to the scene, Ye was lying on the ground near the burning jet. At first, officials said the drivers of the trucks that hit her might not have seen the teenager because she had been covered by foam spread by other firefighters. The foam may still have played a critical role. Tuesday evening, CBS News broadcast clips from videos taken during the hectic moments at the scene that add more detail to the tragic events. The images come from a helmet camera worn by one firefighter and from a camera mounted on one of the emergency vehicles. CBS says its sources for the videos include someone "close to the family of Ye Meng Yuan." The family is suing the city of San Francisco, "claiming that the rescuers were reckless and poorly trained." As CBS SF Bay Area (KPIX5-TV) says, the videos show "firefighters being warned more than once about the location of [the] teenage victim." In early parts of the videos, what appears to be the teen's body had not yet been covered by foam. But as firefighters sprayed the plane and surrounding area with foam, it appears that Ye did get covered. It was "some 15 minutes after the [first] driver was ... alerted about the victim" that she was run over, CBS says. Why hadn't she been moved before that could happen? That question hasn't been answered. But CBS does report that a fire department lieutenant who was at the scene later told investigators that "she made a three-second visual assessment" of the girl and concluded "that's our first casualty" — indicating that she might have believed Ye was dead. The lieutenant testified that she did not check Ye's vital signs, CBS says. Last month, as KPIX5 adds, San Francisco Fire Department Chief Joanne Hayes-White said: "Our members that day had difficult decisions to make. One was visualizing someone that appeared to be dead versus going onto the burning plane with reports of people that still needed to be rescued." Two other people died from injuries they sustained during the crash. The other 304 people aboard survived. Investigators believe the plane was traveling at too low a speed and too low an altitude before its tail struck a seawall. The impact sent the jet twisting and twirling down the runway. A view from above of the wreckage after Asiana Flight 214 crashed at San Francisco International Airport on July 6, 2013.